Thank you for visiting Desert Therapy and meeting our therapists. Please don’t hesitate to call or contact our office if you have any questions. Joyce Elizabeth is a native Tucsonan and loving mother of two. She became invested in health and wellness at a young age. 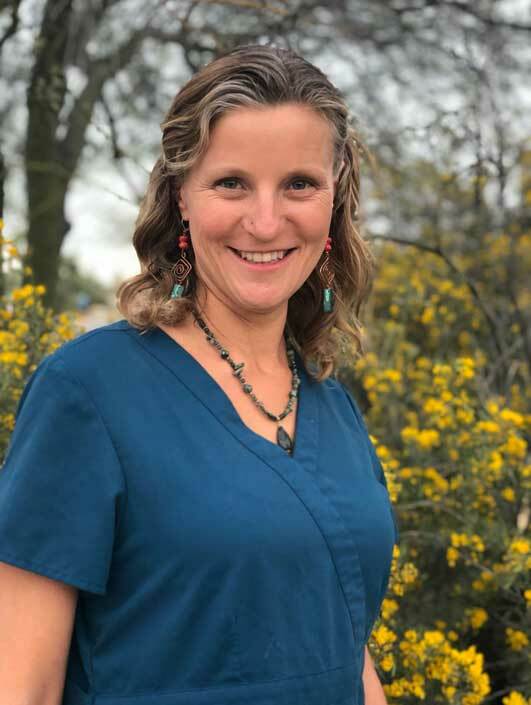 After working for seven years at the Co-op in Tucson where she gained valuable experience in the organic and natural foods culture, she became a medical assistant for naturopathic physician Dr. Judy Hiell. During her four years with Dr. Hiell, Joyce began training for her certification as a Colon Hydrotherapist. She received her certificate of training at the American Institute of Natural Health in Phoenix, AZ in 2007. In December 2009 Joyce opened Desert Therapy with the full support of her family. Joyce has a warm and comforting nature that truly helps ease your experience causing it to be a better one. She is dedicated to helping others feel and be their best and loves doing so. Katrina is a loving mother living a healthy and mindful lifestyle. She offers a very safe, gentle and nurturing space for healing during her treatment sessions. She incorporates her knowledge of Massage Therapy, Yoga and Ayurvedic medicine into each treatment along with her personal experience of healing herself of autoimmune disease through a clean diet, colon cleansing and healthy living. She has lived and worked in India where she studied Yoga, Meditation and Ayurvedic Medicine. She is also a Massage Therapist focusing mostly on eastern modalities and Thai Yoga Massage. As her interests in health and healing evolved she started studying with Shipibo shamans in the jungles of Peru learning about Amazonian Plant Medicine. Her interest in Colon Hydro-Therapy started 12 years ago when she began her first treatment session with Joyce Elizabeth. After experiencing the immense benefits of colon hydro-therapy she knew she wanted to incorporate this healing modality into her repertoire. In addition to her experiences with holistic wellness, she also has a very diverse background with a B.S. degree in Computer Science that allowed her to travel the world while working, including being stationed on the South Pole of Antarctica. Katrina’s passion is to help people get to their next level of wellness. She is known for her gentle and nurturing techniques that help put clients at ease and achieve amazing results, even those experiencing their first treatment. Katrina has a true calling to help her clients achieve optimal health and well being through colon hydro-therapy. Desert Therapy is excited to announce the addition of Cassandra Mertz to the Desert Therapy team. Cassandra is a devoted mother of two children and a passionate advocate for healthy lifestyles. Growing up as a military brat, she has traveled extensively throughout the US and to Japan, finally settling in the warm desert of Tucson. As a military widow, Cassandra understands how our family and life events have a great impact on our mentality and health despite the healthiest diets. Cassandra began her journey to understand healing after struggling with hypothyroidism and Hashimoto’s disease. Finding a naturopath who helped her identify her disease after years of misdiagnosis, Cassandra was finally able to heal with the correct treatments and begin to feel great. Cassandra is pursuing her studies in nutrition and is a Certified Health Coach and is extremely knowledgeable in the field of health and nutrition. Colon hydro therapy was instrumental in helping Cassandra feel her best and help her digestion return to a healthy normal. After being a client of Desert Therapy for years, Cassandra was overjoyed to have the opportunity to study at the American Institute of Natural Health in Phoenix, followed by training under Joyce Elizabeth to become a certified colon hydro therapist and to work at Desert Therapy. Cassandra is an enthusiastic and knowledgeable therapist who genuinely wants to help others find their own path toward true health and well-being. She is an open-minded and caring person who is eager to help and learn. Courtney’s​​ passion​ as​ ​ a​ ​ massage​ ​ therapist​ ​ is​ ​ to​ ​ help​ ​ clients​ ​ on​ ​ their​ ​ conscious​ ​ journeys​ ​ to​ ​ their highest​ ​ mind/body/spirit​ ​ potential.​ ​ Massage​ ​ therapy​ ​ is​ ​ a​ ​ type​ ​ of​ ​ bodywork​ ​ that​ ​ has​ ​ many therapeutic​ ​ benefits​ ​ other​ ​ than​ ​ just​ ​ relaxation.​ ​ Her​ ​ style​ ​ of​ ​ massage​ ​ therapy​ ​ focuses​ ​ on addressing​ ​ client’s​ ​ specific​ ​ ailments​ ​ and​ ​ discomforts​ ​ on​ ​ an​ ​ individual​ ​ basis.​ ​ These​ ​ issues​ ​ may range​ ​ from​ ​ low​ ​ back​ ​ pain,​ ​ headaches,​ ​ neck​ ​ and​ ​ shoulder​ ​ tension,​ ​ limited​ ​ range​ ​ of​ ​ motion, carpal​ ​ tunnel​ ​ syndrome,​ ​ pain​ ​ from​ ​ a​ ​ car​ ​ accident,​ ​ or​ ​ elevated​ ​ stress​ ​ levels.​ ​ By​ ​ creating​ ​ a serene​ ​ and​ ​ safe​ ​ space,​ ​ she​ ​ and​ ​ her​ ​ clients​ ​ are​ ​ able​ ​ to​ ​ objectively​ ​ work​ ​ together​ ​ on​ ​ common goals​ ​ and​ ​ experience​ ​ healing​ ​ results. Courtney’s​ ​ clients​ ​ appreciate​ ​ her​ ​ genuine,​ ​ intuitive​ ​ and​ ​ knowledge-based​ ​ abilities.​ ​ She​ ​ received her​ ​ education​ ​ from​ ​ Wellspring​ ​ School​ ​ of​ ​ Allied​ ​ Health​ ​ in​ ​ Lawrence,​ ​ Kansas.​ ​ After​ ​ graduating with​ ​ over​ ​ 900​ ​ hours,​ ​ she​ ​ relocated​ ​ to​ ​ Arizona,​ ​ and​ ​ became​ ​ licensed​ ​ shortly​ ​ thereafter.​ ​ She​ ​ has worked​ ​ out​ ​ of​ ​ a​ ​ chiropractic​ ​ office​ ​ doing​ ​ massage​ ​ therapy​ ​ full-time​ ​ for​ ​ over​ ​ a​ ​ year​ ​ and​ ​ a​ ​ half. Her​ ​ belief​ ​ is​ ​ that​ ​ Massage​ ​ therapy​ ​ is​ ​ not​ ​ a​ ​ luxury,​ ​ rather​ ​ a​ ​ necessity​ ​ to​ ​ complete​ ​ wellness. Andrea’s intuitive and compassionate touch supports clients reconnection with their own personal power and joy. Through conscious connection, she believes everyone has the power within themselves to reconnect to their body’s own internal intelligence that knows exactly what they need to facilitate their own healing. During treatments, Andrea serves as a conduit connecting the client to this innate healing intelligence and constructs a treatment plan focusing on restoring balance and harmony to body, mind and spirit. In 2000, Andrea graduated from a 1000 hour Massage Therapy Program at The Desert Institute of the Healing Arts and has been practicing in the healing arts for 17 years. She is trained in both Upledger and Biodynamic Craniosacral Therapy principles, is a Reiki Master and Certified QiGong Instructor. Andrea’s specialties include Therapeutic Massage, Prenatal Massage, Myofascial Release, Biodynamic Craniosacral Therapy, Lymphatic Facial Rejuvenation, and Energy Healing.